Why Choose CP Lab Safety? Avoid EPA Fines: Are you in Compliance? 20-415 caps are designed specifically for bottles, vials and containers with a 20-415 thread finish. 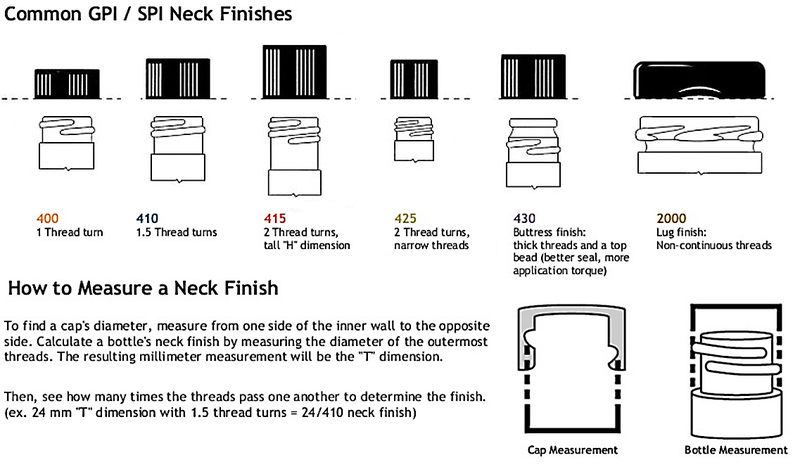 Caps and closures are measured using two numbers in the format of 20-415 or 20/415: the first number is the distance in millimeters from outer thread to outer thread when looking at the top of the container; the second is a reference to the design of the threads themselves. Review the image to the right in order to understand thread design, to assist you in selecting the correct cap for your bottle or container. Carefully review your container's threads before selecting a cap even if you know the first measurement; not all 20mm caps will fit a 20mm opening, due to the differences in thread types between manufacturers.